Christmas is a festival that marks the birth of Jesus Christ, a messiah, spiritual leader and a great soul. 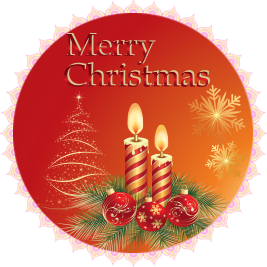 Christmas can be regarded as the most widely celebrated festival in the world. It is a religious, cultural and social event, observed by billions of people from a great many countries. It is celebrated every year on December 25. The birth of Jesus happened in the present day Israel about 2000 years ago. It is regarded, perhaps, as an important event that took place on earth, as calculation of time itself got divided by that happening as BC (Before Christ) and AD (Anno Domini, that is, the year of the Lord). He was born as a humble son to a poor carpenter in Bethlehem and grew up in Nazareth, which got him the name - Jesus of Nazareth. He began preaching in public when he was around 30, spreading love, guiding people in the path of virtue and performing miracles to help the poor, sick and the downtrodden. People began flocking to him in great numbers seeking his guidance. However, the Jewish priests felt threatened by his popularity and activities and pressurized the Roman governor to put him to death. Jesus was caught, tortured and crucified. But, a sensational miracle took place, as Jesus rose from death on the third day, journeyed around for 40 days and then ascended to the heaven with his body, in front of many of his disciples. The news spread like wildfire, people began hailing him as ‘Jesus Christ,’ Jesus, the Messiah and started following his teachings in huge numbers. In about three centuries, Christianity became the official religion of the great Roman Empire. Gradually, Christianity became a global religion. Christmas stands for Christ’s Mass, the religious service of Jesus. It has an interesting history behind it. In the earlier days, only Jesus’s rising from death was celebrated as Easter and his day of birth was not observed, as it was not mentioned in the Bible. Pope Julius I of the 4th century chose December 25 as the day of the advent of Jesus, absorbing the prevailing religious traditions then. This day was known, initially, as the Feast of Nativity. Then it spread to Egypt, then to England, and later to northern Europe by the 8th century. Soon, this Christmas day spread throughout the Christian world, both as a pious and as a joyous occasion. Jesus’s birthday of Christmas is actually believed to be the day when the three wise men found the newborn Jesus in the manger. Christmas is an occasion for devoted religious observance and a grand celebration. Billions of people all over the globe look forward to this occasion with eagerness and celebrate it with family and friends, with immense enthusiasm. Churches and homes are well decorated for the occasion and are made ready to welcome infant Jesus. There are special midnight masses and prayer services in all Churches, which are attended by thousands of devout. It is a traditional practice to create the nativity scene regarding the birth of Jesus with the setting up of a crib, in Churches, homes and even in public places. Group singing of Christmas carols, the devotional songs, is another popular tradition, which is followed in many places. Tastefully decorated Christmas trees, big and small, are also set up at many spots, including public places. Santa Claus, the genial white-bearded grand old man, is an inseparable part of Christmas celebration as he arrives on Christmas Eve with plenty of presents for the children. Public places also see grand decorations and are well-lit during Christmas time. People wear new clothes, offer prayers to the Lord, exchange ‘Merry Christmas’ greetings with one another, share gifts, visit friends and relatives, and enjoy the day with sumptuous feasts.